From a delivery boy to one of the most important industrialists in American history, George Eastman s career developed in a particularly American way. The founder of Kodak died in 1932, and left his house to the University of Rochester. Since 1949 the site has operated as an international museum of photography and film, and today holds the largest collection of its kind in the world. The continually expanding photography collection contains over 400,000 images and negatives - among them the work of Alfred Stieglitz, Edward Steichen, Ansel Adams and others - as well as 23,000 cinema films, five million film stills, one of the most important silent film collections, technical equipment and a library with 40,000 books on photography and film. The George Eastman House is a pilgrimage site and a place of worship for researchers, photographers and collectors from all over the world. De chico de los recados a uno de los industriales más importantes en la historia de Estados Unidos, la trayectoria de George Eastman se desarrolló de un modo singularmente norteamericano. El fundador de Kodak murió en 1932 y legó su casa a la Universidad de Rochester. Desde 1949, el lugar ha funcionado como un museo internacional de fotografía y cine y hoy acoge la colección de su categoría más grande del mundo. Continuamente en expansión, la colección contiene más de 400.000 imágenes y negativos ―entre ellos la obra de Alfred Stieglitz, Edward Steichen, Ansel Adams y otros―, así como 23.000 películas de cine, cinco millones de fotos de películas, una de las colecciones de cine mudo más importantes, equipo técnico y una biblioteca de 40.000 libros sobre fotografía y cine. La Casa George Eastman es lugar de peregrinación para investigadores, fotógrafos y coleccionistas de todo el mundo. Este volumen muestra en orden cronológico las imágenes más impresionantes y ofrece una panorámica única de la historia de la fotografía. 5. 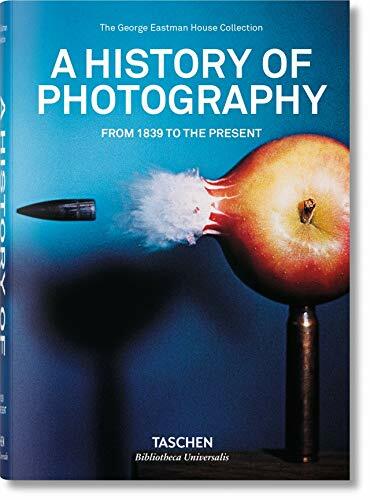 A history of photography: From 1839 to the present. THE GEORGE EASTMAN HOUSE COLLECTION.